Aspidelaps l. lubricus is a small elapid snake that lives in the south of the African continent (southern Namibia and Rep. of South Africa). It rarely exceeds 60-70 cm in length. Like its relatives, the cobras, it is a proteroglyphous snake. An alternative vernacular name is shield-nosed cobra, which is in a way fitting because of its enlarged rostral shield that already indicates that Aspidelaps is a burrowing snake. It is orange above, with narrow black rings that encircle the entire body. The lower side is whitish. 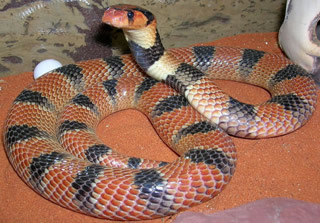 The orange scales may be bordered with black along their rear edges, and specimens coloured thus usually appear darker and less colourful than those without these black markings. The head is little distinct from the body. The pupil is round. There are two more subspecies, Aspidelaps l. infuscatus and Aspidelaps l. cowlesi. As far as toxicity is concerned, I can only say that the two subspecies are more dangerous than the nominate form. !! !Nevertheless, this is a venomous snake that demands respect and careful handling!!! Thick leather gloves are a must. There is no antiserum available. The terrarium can be very simple. Fine sand of at minimum 7-8 cm deep, a large flake of slate, and a water bowl are basically all it takes. The spot beneath the water bowl will always be a little moist, and it is there where the animals will often be found, in particular at times before moulting. The snake’s appearance does not provide hints of how well it can climb! Branchwork and cork tubes are therefore not only visually appealing, but also increase the usable space of a terrarium. Personally, I think that enclosures should be at least 80 x 40 x 40 cm in size. Temperatures during the day should range between 25 and 28°C, with a localized hotspot under a small spotlight (25 or 40 W) offering 35-38°C. At night, room temperatures of approximately 17-20°C suffice. Adult specimens should be allowed to hibernate if they are expected to reproduce. Hatchling Aspidelaps are very small and thin when they emerge from their eggs. They would normally feed on very small lizards in nature. Raising them can therefore be a challenge, as even newly born mice may just be too large for them to manage. They often need to be forcefed with parts of mouse-tails or dead pink mice that have been halved along the long axis until the baby snakes have grown to a size at which they can ingest pink mice on their own. As soon as they feed all by themselves, they grow rapidly to 50-60 cm in length. They become sexually mature at an age of about three years.